This system was installed on a dormer roof with a lower slope of 28 degrees in comparison to the main roof, with a slope of 36 degrees. This section of the roof faces south-southwest. The modest size system consists of 10 panels, but covers the majority of the electricity used in the house. The electricity produced back feeds the main 100 amp panel in the house. Typically a conduit run goes down the side of a house directly to the electric panel. The conduit run from this system runs down the backside of the roof to be completely out of sight; no one can see conduit when looking from the road. In order to install the panels on the dormer, a vent had to be moved. The panels were laid out in portrait and fit perfectly on the roof footprint. The grant covered 25% of the installation cost. The owner of this system valued the financial return as well as the environmental benefits associated with solar installations. 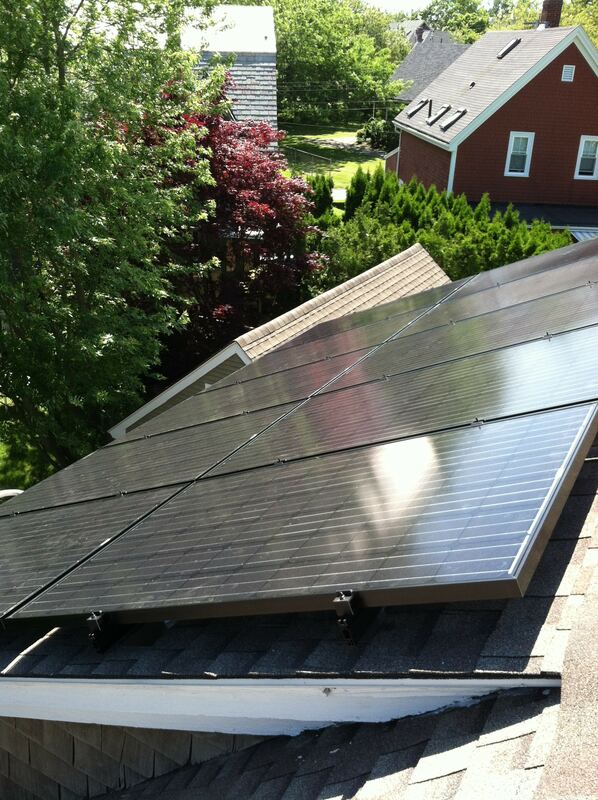 In addition, the owner tracks his system performance live via Enphase on his iPhone.